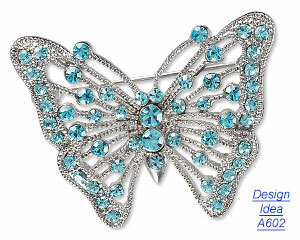 The butterfly is a popular and beloved motif for jewelry and art alike. Imprinted in our minds from an early age, butterflies represent happiness, beauty and bring life and movement to artistic creations. These colorful creatures transport us back to our early days of creativity with sketch pads and crayons, as we filled blank pages with butterflies in every color imaginable. Back to a time when wings were magical and our inspiration was limitless. Butterflies offer comfort to the creative soul. 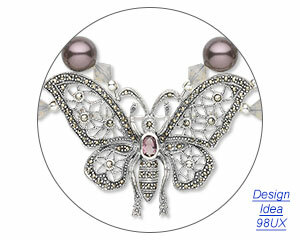 Jewelry artists can easily add this popular motif using butterfly beads and components. Just as butterflies take flight every spring, butterfly-themed jewelry and accessories emerge as fashion-forward favorites every year. Throughout history, butterfly imagery has been used in decorative objects and people have adorned themselves in butterfly-themed designs. The popularity of the butterfly has stood the test of time. Artistic depictions of butterflies can been found dating back to ancient Egyptian hieroglyphs and more recently on American singer-songwriter Mariah Carey in the form of an 18Kt white gold and diamond Van Cleef and Arpels Envol butterfly ring. Also, one of the most popular tattoo images is a butterfly. Butterfly-themed jewelry and accessories emerge as fashion-forward favorites every year. The symbolic meaning of the butterfly is similar across most cultures, regardless of time, and is most commonly associated with the soul. Cultural myth and lore honor the butterfly as a symbol of transformation because of its impressive metamorphosis--from caterpillar, to chrysalis and ultimately, the butterfly. Butterflies also symbolize spring, a celebratory time of year, and embody the beauty of symmetry, pattern, color and shape. These colorful and vibrant, yet delicate creatures can imply freedom, endurance, inspiration, openness, change, joy, rebirth, patience, transformation and happiness. The fluttery perfection of butterflies is believed to lighten the heart, and promote love and relationships. In Chinese culture, two butterflies flying together is a symbol of love. It is also commonly believed that when a butterfly lands on you it means good luck. In some myths, the butterfly promotes sleep and dreams. In others, it is symbolic of female fertility. Butterflies often represent celebrations, weddings, life and journeys. They serve as a reminder of how beautiful and fragile life can be, and the importance of appreciating and being grateful for each moment. Butterflies' bright and colorful wing patterns are bold statements as they flutter and dance on the wearer. 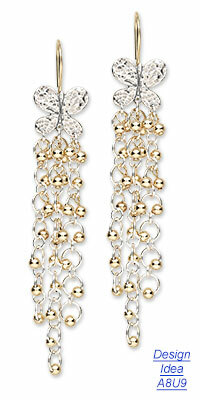 Butterfly-themed jewelry offers universal appeal, seasonless style and brings a sense of fun and whimsy to any look. Butterfly jewelry can be an inspirational gift to someone who is embarking on a challenge or life-changing journey. As a symbol of love, butterfly accents are a sentimental addition for wedding and bridal jewelry. The sky's the limit! Similar to the wide variety of species of butterflies, these creatures can be found in precious and plated metal, crystal, acrylic and more. Jewelry adorned with butterflies brings a smile to one's face, lifts their spirit and spreads joy. It's a feel-good way to accessorize. Capture these fun-loving, colorful, fluttering friends in jewelry creations for designs that are sure to please.